For one first-year medical student, dissecting a cadaver brings about not just intimate knowledge of a human body but a personal transformation. 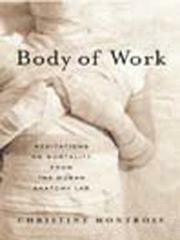 Montross, writing this memoir in her final year of medical school, finds herself “performing previously unthinkable actions in order to discover wondrous and previously unimaginable realms.” She reports in vivid, often poetic detail the physical, mental and emotional demands of meticulously taking apart the dead body of a woman she calls Eve, an experience that enthralls her, exhausts her, gives her haunting dreams and teaches her human anatomy as no textbook could. Beginning with the chest and ending with the head, she and three classmates painstakingly explore parts of Eve’s body, learning to identify organs, muscles, tendons, blood vessels and nerves. For those who have never been there, this is uncomfortably close to the real thing. It is tedious, smelly and demanding work, but at the same time an essential task for medical students and for Montross an especially rewarding one. The summer after her anatomy lab course ends, she travels to Padua to see where Vesalius performed his historic dissections—illustrations from the anatomist’s De Humani Corporis Fabrica introduce each chapter—and to Bologna to see the collection of wax sculptures used for teaching anatomy in the 18th century. Going beyond personal experience, she discusses the myths and superstitions surrounding dead bodies, and she provides a capsule history of cadaver supply from the 16th century on, including the Scottish “resurrectionists” Burke and Hare, who went from grave robbing to smothering to provide medical students with fresh bodies. Other themes explored include the process of dying, the ethics of medical training and the emotional difficulty of dissecting a cadaver. Not for the squeamish, but an eye-opener for would-be doctors.